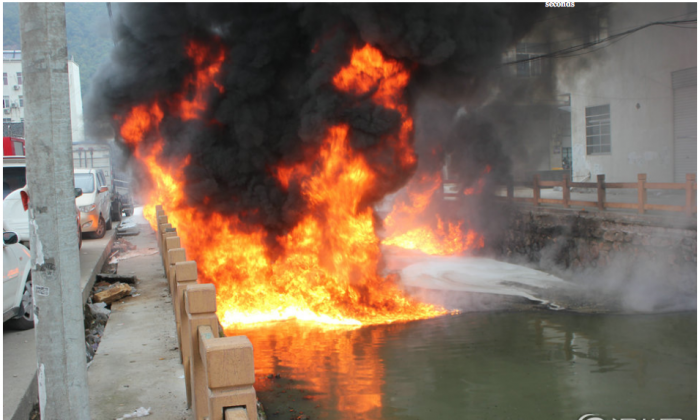 A fire started on a river in Zhejiang Province, and appears to be linked with black oil released by a factory upstream. A section of the Meiyu River in Wenzhou caught fire early on Wednesday morning. The blaze was spotted by a street sweeper, who called emergency services, Wenzhou News reported. Firefighters had to use a special foam on the water surface to extinguish the flames, which by that time reached over 16 feet high, and were threatening nearby buildings. A wooden railing was also alight, and three parked cars were gutted. The cause of the fire is unknown, but locals speculated that it could have been started by a cigarette being tossed into the river where the oil was floating. Mrs. Wu, whose shop faces that part of the river, told the reporter that her son usually plays next to that area. She added that fortunately she was late to work that day, so the shop door was still closed, otherwise the fire could have damaged her shop too. A spokesman called Mr. Huang from Wenzhou Yashenda Shoe Material Ltd said a worker error on Monday led to about 1 ton of softener oil being dumped into the river, but he claimed it was not flammable. The company has been closed until further notice, and an investigation is underway that may lead to a fine of up to 20,000 yuan ($3,269). Locals say the river has smelled bad for years due to effluent from shoe factories and packaging companies upstream, according to Wenzhou News. Apparently the environmental protection bureau has not placed restrictions on the offending companies, because they are a significant part of the local economy. A baby died after being thrown into a river in Henan Province, while its parents were arguing.